For over 30 years, the Shad Valley organization has been dedicated to bringing out the entrepreneurial spirit in Canada’s brightest and most engaged secondary school students. The RIM-sponsored Shad Valley Entrepreneurship Cup this year, hosted young people at Universities across Canada for a four-week, summer enrichment adventure. At each campus, participants live in residence and together, create a company, develop a product, prototype it, prepare a marketing plan, and submit it for judging to determine a National Champion. For 2011, there were ten competing Shad Valley companies and 240 students participating. Each company was evaluated in seven categories: Best Business Plan, Best Application of Scientific Principles, Best Application of Theme, Best Website, Best Prototype, Best Marketing, and Best Overall Project. content—does the site do a good job of describing the product/project and is the material relevant? structure—is the information mapped in easy-to-read segments and is the structure logical? style—are the graphics and images consistent and appropriate to the content? Three things you missed if you didn’t attend our Design Thinking Workshop last week! On September 22, we welcomed a dozen eager innovators, working in community or business development from both profit and not-for-profit organizations across KW Region, to our offices for our first Design Thinking Basics Workshop of the fall season. 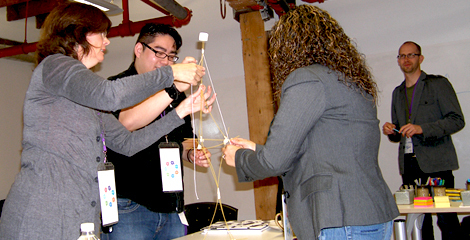 We kicked off the day with the Marshmallow Challenge, a hands-on design challenge, which illustrates how we all make assumptions when approaching situations or problems, and reinforces the importance of truly understanding the issue at hand. 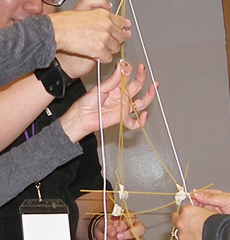 Something interesting to note: the highest marshmallow challenge recorded was 48”…check out the marshmallow structure built in our session. Next, we dove into the core principles and process of Design Thinking, which introduced the importance of using Design Thinking tools like Empathy Maps to identify with target customers, as well as Process Mapping, which allow you to take a problem and break it down into smaller, easily digestible pieces. The highlight of the day, according to attendee feedback, came in the second half, when the group selected a real life business problem to solve using the Design Thinking techniques they’d already learned. We encouraged group brainstorming using a technique called the Abstraction Ladder, which pulls apart a problem for clarity and effective problem solving. From the ideas generated, the group selected two ideas for prototyping. Using Lego, storyboards and sketches to bring their ideas to life, the prototypes were presented and further refined based on feedback from the entire group.